As the freezing cold wind twirled snow into the night air last Thursday, the inside of Centre for Print and Media Arts was filled with warmth. Chai was brewing and connections were being made as members of the community gathered inside for the first Zine Club meeting. The free club is the first of its kind at Centre and is designed for zine creators, writers, artists and all others interested in the culture surrounding these DIY publications. The meetings are set for the second Thursday of every month. The club coordinators are Centre program coordinator Sonali Menezes and administrative coordinator Mariel Rutherford. They had no idea what kind of turnout to expect for this first meeting and were overwhelmed as people continuously trickled in from the cold, quickly filling up the prepared seats. 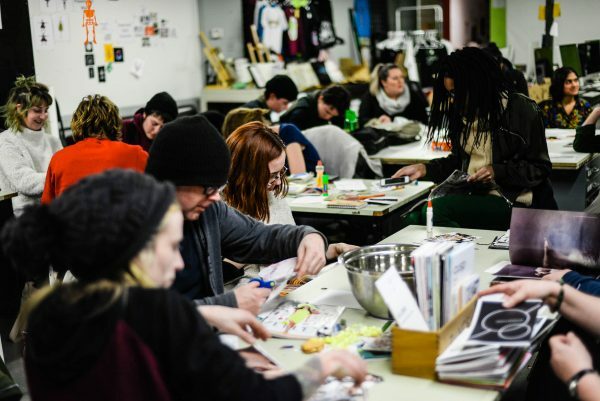 The idea for the club was sparked by a desire to create a space for Hamilton’s zine creators, who often call themselves “zinesters”, and welcome them to the facilities at Centre. “[I]t really came out of trying to engage with a younger membership and trying to show people what we offer… [S]ometimes Center as a printing house can be really intimidating to people who are younger so… we just want people to know that our doors are open,” Rutherford said. However, it was not just a younger crowd that came through the doors on Jan. 10 but individuals of all ages. Nor were only zine creators interested. While some were zine artists like emerging artist-in-residence Laura K. Watson, others had never read a zine before or did not align themselves with an artistic form. The first meeting was structured to get everyone on the same page. After an introductory icebreaker, Menezes and Rutherford passed out various magazines. Together, the group made a list of themes present and feelings evoked. Flipping through, people repeatedly noted the presence of advertisements, advice championing success and models with “perfect” faces and bodies. People commented on how it made them feel broke and insecure. Next Rutherford and Menezes handed out zines from Menezes’ personal library. The reactions were notably different as participants commented how the zines were diverse, inclusive, informative and funny. The difference highlights what has drawn people to zines throughout its long history. Zines are traceable back to the science fiction fans of 1920s and 1930s. From the poets of the 1950s to punk movement members of the 1970s, individuals through the decades have been drawn to the idea of being able to share their own ideas in a DIY way. It is also what has made Menezes and Rutherford zine creators themselves. Rutherford got started recently started making zines of her illustrations last year while Menezes has been making zines for the past seven years. “I got started in school… I just really caught on to zines and I just love making them. I love going to zine fairs and sharing zines with people and meeting zinesters. Zinesters are really nice people. 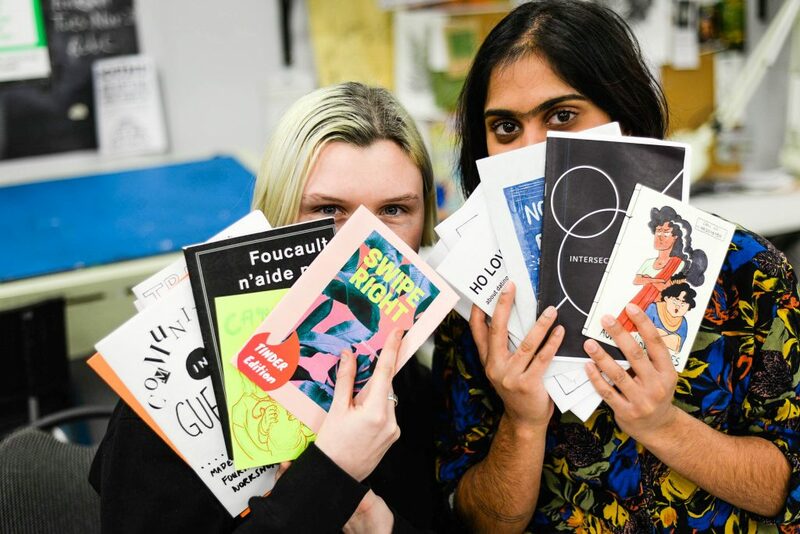 Like the best way to make friends when you move to a city is to go to zine fair,” explained Menezes. In the spirit of zine culture, the meeting was also very DIY. Rutherford and Menezes had participants create a list of what they wanted zine club to be. Ideas ranged from having question and answer, information and skill share sessions and workshops to hosting zine exchanges, hangouts and working on a collaborative zine. When it finally came to creating at the end of the night, laughter echoed alongside the music playing in the background. The coordinators wanted participants to feel safe, creatively stimulated and supported while occupying the space. “[W]e want to create… a space where people can find their niche. And like zines are very niche-y and they’re very specific. Come find your niche! Like find the spot where you fit in… It’s so nice connecting with other weirdos,” Menezes said. Everyone created a page to be included in a collaborative zine. As neighbours shared glue, scissors and markers, they also shared their ideas and got to know one another. Each person brought their own talents to the page. 100 Word Copy: Centre for Print and Media Arts hosted the first meeting of its first Zine Club on Jan. 10. With a turnout larger than expected, the monthly club will continue to meet on the second Thursday of each month. It is a space for zinesters and those curious about zines to gather, work together and hang out. Will you be checking out the Zine Club?